How to Increase Productivity (of Workers) at Construction Sites? The world, especially the developing nations, is in a transition phase. Population, in almost all countries, is growing, and so is growing the need to provide them with sufficient housing and infrastructure. The players in the construction sector are busy than ever and are increasingly leveraging on machines and skilled labor to make the most of opportunities. Give them best protection & COMFORT; they’ll give you the best performance! A construction site is prone to injuries and accidents. Bricks may fall on the feet of the workers. Someone may slip or trip; their feet may get tired and develop germs. All this is likely to lead to disturbance on the site, and higher absenteeism, which would then adversely affect the productivity. With the right set of protective footwear, you can significantly bring down injuries/accidents on the site, and also meet the safety norms. 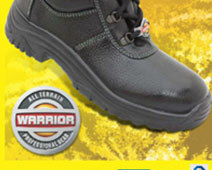 Warrior Professional Gear is much more than just safety footwear. They possess the essential features including water proofing, oil & abrasion resistance, ability to absorb IMPACT LOAD of up to 200 joules, slip and trip resistance, etc. 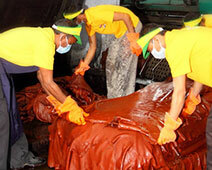 SECONDLY, WE MUST UNDERSTAND WHY THE WORKER DOES NOT GIVE OPTIMUM PRODUCTIVITY. INCASE THE FOOT AND THE FINGER OF THE USER IS BITING CONTINOUSLY THE ATTENTION OF THE WORKER WILL BE DIVERTED TO THE AREA WHERE THE SHOE PINCHES & LESS ON THE QUALITY & PRODUCTIVITY FOR THE JOB. THUS AT LIBERTY AFTER LOT OF RESEARCH TRIAL OF VARIOUS INDUSTRIES, A PROPER LAST HAS BEEN DESIGNED & DEVELOPED WITH THE HELP OF EUROPEAN DESIGNER CONSIDERING FOOT ANATOMY OF HUMAN FOOT. THUS, they’re built to fit well and keep the feet of the workforce relaxed so they can work for long hours and also stay safe. These shoes are built from genuine leather uppers and direct injection P.U. soles ( LIGHT WEIGHT), and are fitted with IMPORTED metal toe caps for extra protection on the toe region of the wearer. Besides foot protection, the workers and professionals should also be provided with head protection so they can go about their work with total confidence. Apart from protection, there are several other factors that impact workers’ productivity on construction sites. For instance, they need to possess skills required to perform their duties; whether it is a machine operator or a helper performing many basic tasks that require physical labor on the site, they need to possess skills. A business should, therefore, emphasis on having the right set of laborers and professionals (such as construction manager) on the site for improved productivity. We’re done here. But, we’ll surely come out with many more tips and tricks for enhanced productivity for construction workforce in our up-and-coming posts. So stay glued!